Photographers to get name-checked, thanks to new update. Google Images has always been a rich source of photography but there has been one big thing missing from it for a while: correct credit metadata. Without this, an image has the potential to be used by myriad sites with no credit going to the original maker of the photograph. It's been a huge hole in Google's imaging plans but that is all set to change thanks to a big Google Images update. In a blog post Google explained the change, noting it has all come about because of a collaboration between Google and photo industry consortium CEPIC, and IPTC. "It’s traditionally been difficult to know the creator of images on the web, as well as who might own the rights," says Google. "This information is often part of image metadata, and is key to protecting image copyright and licensing information. 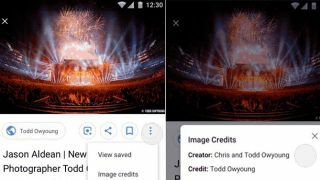 "Starting today, we’ve added Creator and Credit metadata whenever present to images on Google Images... over the coming weeks, we will also add Copyright Notice metadata." It seems Google is trying to get as much out of its partnerships as possible and will also be creating "better usage guidance" for how Google Images is used by photographers, photo agencies and publishers - so that copyright and attribution information is present in image metadata.